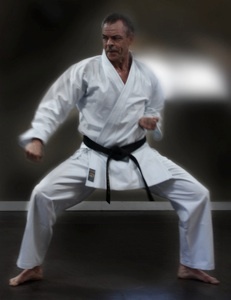 Sensei Mac Newton has been teaching karate (the traditional Okinawa style of Goju-ryu) and kobudo to adults and children on Vancouver Island for since 1999. His philosophy is that a dojo (karate training place) is a community and that the learning of martial arts must be both fun and challenging enough that students grow and develop in mind, body and spirit. "Making it fun is the key, especially for the children," says Sensei Mac, " but enjoyment of the practice is necessary for adults, too, of course, and part of that enjoyment includes comradarie with fellow students, a sense of humour in the dojo and training that is challenging enough to make it interesting. Train hard, have fun." The practice of karate gives one skills in self-defense, builds confidence and empathy for others, increases flexibility, coordination, strength, agility and balance. Karate is as much about exercise for the mind as it is for the body. One learns some Japanese language and culture, pattern recognition, memory improvement. "Karate is for all ages," says Sensei Mac. "I have taught students from age 6 to 75. And, it can be a lifetime of learning. I still travel several times a year to train with and learn from my sensei. What I learn from them, I bring back to my students. There are also opportunities for my students to take part in extra seminars and tournaments." Toshikan Martial Arts belongs to the International Okinawa Goju-Ryu Karate Federation (IOGKF), the world’s largest truly international traditional karate organization with thousands of members on every continent. The membership means that achievements accomplished by students in the dojo are recognized by the international organization.